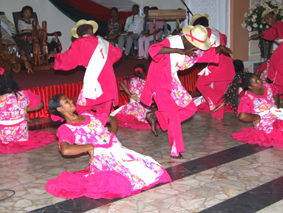 In Madagascar, their music styles include both sacred music and secular music. The sacred music consists of religious and sacramental music tones that call upon their ancestors. The secular music includes the audience and makes it more about musical enjoyment and entertainment, than for religious reasons. Sacred Music in Madagascar is very important to their ceremonies all the time. When they add voices to their music they are ridiculing their dignity and calling the deceased ancestors to come back and join them in song. Their music is a mixture between reality and the spiritual world. Their music is actually played in a specific spiritual way that a person is in a dazed state of mind and a spirit will enter the person (Allen 263). The Famadihana is a ritual where the townspeople take the corpses of the deceased and rewrap their bodies in a clean cloth and dance around with them, while playing music. This tradition is believed to complete the full transformation from human to a spirit and live with the ancestors forever. Some of the Madagascar people will contact the spirits through song by playing the valiha and singing (Graeber 191). Specific spirits will only enter a person if they like the music or song that is being played. The Protestant church has influenced many of the Malagasy people to add harmonies and other styles to their music. Their music is not truly through heredity, but through other cultures that have molded their own music by adding specific techniques. These techniques have made the Malagasy music the way that it is today (Allen 263). 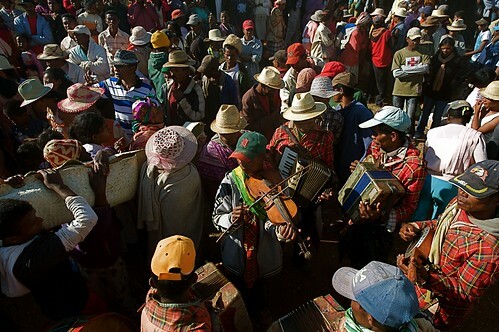 In Madagascar, they have many traditions to their music. The Hira Gasy has the meaning of Malagasy Arts in the community. Some would call it theater but it is a large portion of the culture and weekly activities. Mpihira gasy is known as the most special music performance where groups of males and females dance and sing customary songs of the culture. It is made up of three different portions of an equivalent time-span. Each part begins with the men going out on the stage and then the women follow. The orator comes out and says a speech before the singing and dancing starts. To this day it is based on the late 1700’s performance style from king Andrianampoinimerina. The themes of the different performances are usually about matrimony, farming, and business. The artists will act out the theme by singing and also by acting it out by miming. After they act out the theme, the performance then moves to a fifteen-minute intense dance with music as an accompaniment. The performance is ended by a kabary (ending dialogue), which summarizes the theme of the play and finalizes the performance. The mosika (music in Malgasy language) in the presentation is very ostentatious and flavorful. The music makes the audience move to the beat and dance around (Cyrille). Music is not only performed in the theater but the Mpihira gasy perform well-known music compositions in the market areas and also giving a great message and/or theme to the townspeople. On the island, there are hired musicians that sing and dance to set the stage for special festivities and events (Allen 263). There is a famous Jazz Musician Nicolas Rakotovao known as “Vatomanga," blends music from both Miles Davis and Debussy with Malagasy culture together perfectly. His music sounds very jazzy and has great techniques throughout the songs (Allen 263). The most famous singer in all of Madagascar and known worldwide is the musician named Jaojoby. His music styling is that of Caribbean, Spanish and African styling together. This mix of music styles is called Salegy, it is called Afropop and it has been around since the 1950’s. The basis of the styling is based on traditional songs,; however, like most music it has changed to cope with the changing times. By the 90’s Salegy was the new dance music of the island (Eyre).